What does Advanced Segmentation in Google Analytics mean? A key part of any analysts job is the segmenting of data—that is, the grouping (or separating) of data into similar “types”. Without doing this, you either end up analysing all of your disparate data so that you only can see the big changes in patterns (missing the detail), or focus on individual sessions resulting in missing the bigger picture as well as potentially simply looking at the wrong sessions the e.g. least valuable one. 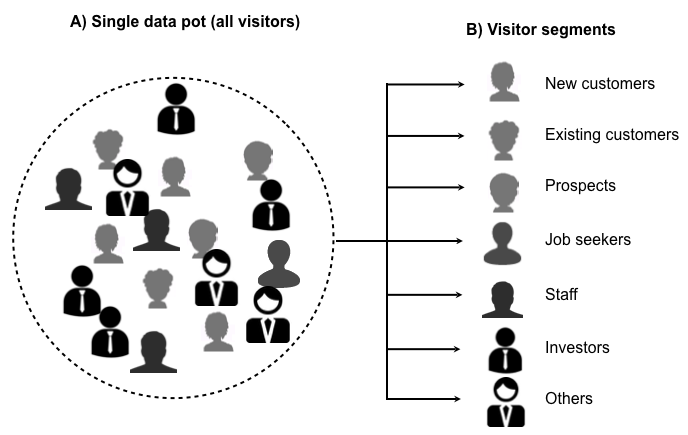 Segments are most powerful when applied at the visitor level i.e. what can you know about a visitor if/when they return? That is, a customer is a customer even if they return to your site many times and do not purchase again. Other visitor segments include non-customers, subscribers, press, staff, interns, suppliers, partners, visitors who have an account, anyone who has sent you an email/submitted a form, or called you while visiting your website. It can also be a combination of all of these. Essentially these are high value users that are building a relationship with your brand – and you need to know this if the user returns and does not do those things again. To achieve advanced segmentation, you define custom dimensions. Once setup, you can then compare your segments side by side, or focus on them specifically. Note segments do not alter your data—they can be applied and unapplied as required and are applicable to historical data as long as the information that defines the segment is present in the historical data. Visualising, automating data quality and make Google Analytics trustworthy. Providing trust in your data and allowing Google Analytics data to be taken seriously. Ensuring decisions are based on solid data.